In his previous incarnation, Lord Rishabha Dev was in the mahavideh shetra as Dhannaseth. He was a big business man. He offered alms and services to many ascetics and others. Later he completed 7 births as Dev and humans. He was then born as Vaidya Jivanand in his 9th incarnation. As Vaidya Jivanand he discovered a medicine for pandu rog (a dreaded skin disease). In his 11th incarnation he was born as Chakravarti King Vajranabh. As King Vajranabh he had supported poor and desolate masses. After many years of public service Vajranabh renounced the world and became an ascetic. As a result of unprecedented spiritual practices, including religious studies, penance, tolerance, and meditation, he earned Tirthankar-nam-and-gotra-karma. These pious deeds of earlier births resulted in his taking birth as Rishabha Dev. With the passage of time gradual changes occurred and around the end of the third Ara the yield from the Kalpa-vrikshas reduced. The alround deterioration in conditions spelled the beginning of quarrels and disputes. To guard against these disputes and to live in peace and harmony, man formed groups and the Kulkar system was evolved. A number of people collected to form a ‘Kula’ (family) and the head of the group was called ‘Kulkar’. It was the duty of the ‘Kulkar’ to remove discord and establish order. Nabhiraja was the seventh and the last in the line of Kulkars. His wife was Marudevi. This epoch of Kulkar system was known as the epoch of twins (Yugalia). A human couple used to give birth to twins - one male and one female. This twin would become husband and wife on reaching adulthood. The twins used to lead a happy and contented life and died a natural death together. To consume what was available was the way of life. As such this period was also known as Bhog-Bhumi-Kaal or the era of free consumption. Up to the time of Kulkar Nabhiraja man lived in this land of abundance. It was during the last part of the third Ara of the current descending cycle of time that the great and pious soul that was to become Rishabhdev descended into the womb of Marudevi on the fourth day of the dark half of the month of Ashadh (according to the Hindu calendar) during the night. When this pious soul was conceived, mother Marudeva dreamt of fourteen (sixteen according to Digambara Jain Sects) auspicious things. Nabhiraja was an experienced and scholarly person. When he heard about these dreams from Maudevi, he said, "Devi! You will give birth to a highly endowed soul who will show the path of peace and happiness to this world"
On the eighth day of the dark half of the month of Chaitra, around midnight, healthy Marudevi gave birth to twins. This pious birth influenced the surroundings. The sky became filled with a soothing glow, the wind became fragrant and the whole atmosphere became impregnated with unprecedented joy that was hard to describe. From all around came the fifty six goddesses of directions. They circumambulated the Tirthankar’s mother and bowed before her. They also sang in praise of the child that was to become Tirthankar and then proceeded to perform post-birth cleaning rituals. At that instant the king of gods of the Saudharm dimension, Saudharmendra Shakra, also came to know that the first Tirthankar has taken birth. He arrived with his large retinue of gods and, bowed before the mother. After the salutations the mother was put to sleep. Saudharmendra created five look alike bodies of himself. With one body he carefully lifted the baby in his hands. With the second body he took an umbrella in his hands and stationed the body behind the baby. With the third and fourth bodies he took whisks and stationed these bodies on both sides of the baby. With the fifth body he lifted his divine weapon, Vajra, and stationed himself ahead of the baby as a body guard. In this formation the king of gods airlifted the baby to Meru mountain. There, all gods, including their 64 kings with their consorts, ceremoniously performed the post-birth anointing rituals. This ceremony, popularly known as Janma-kalyanaka, of a Tirthankar, is unparalleled in this world. Next morning Nabhiraja organized the birth celebrations. He invited his friends and relatives to a feast and announced, "As there is a sign of a bull on the thigh of the new born, and Marudevi first of all saw a bull in her great dreams, we name this child as ‘Rishabha Kumar’." His twin will be known as "Sumangala". When Rishabha Kumar was one year old, Saudharmendra came to Kulkar Nabhi for formalizing the family name. He carried a sugar-cane in his hand Baby Rishabha was sitting in his fathers lap. When he saw the sugar-cane he eagerly extended his tiny hands to grab it. Saudharmendra gave the sugar-cane to the baby and seeing his affinity for sugar-cane (Ikshu) he formally named the family as Ikshvaku. Rishabha Kumar was married to a girl named Sunanda whose twin died in an accident. This was the beginning of the marriage system. He was also married to his twin Sumangala in a ceremony that was arranged by the gods. Prince Rishabha led a happy married life. In due course Sumangala gave birth to Bharat, Brahmi and ninety eight other sons. Sunanda gave birth to Bahubali and Sundari. Prince Rishabha was a highly endowed, farsighted and industrious individual. He had a profound insight into the human psychology. Looking at the needs the times and society he evolved numerous arts, crafts and trades and taught them to people with right aptitude and physical and mental capacities. To some he taught farming and to others the trade of agricultural produce. He invented the alphabets, language, and the numbers along with the tools for writing. Brahmi lipi, named after her daughter is still not a forgotten thing. For self defense he evolved martial arts and taught these to individuals with strong physique. He also established systems of social security and penal codes. Pottery, architecture, music, dance, and many other arts and crafts that enriched the human society in the fields of knowledge, arts, entertainment, administration, etc. are said to be his contributions. Slowly and steadily king Nabhi started putting major responsibilities of his Kingdom on Rishabha dev. Such was the effect of Rishabha dev's words, that by just saying, "Oh! Man! You should have not done this, the culprit felt ashamed and stopped his bad works immediately. When Nabhi Raja saw that Rishabha dev has taken all the responsibilities of kingdom and performing them very well. Infact he seemed to have become idol of people. He then one day, on the request of the people’s representatives, nominated Rishabha to become the first king of this age. He arranged for an elaborate coronation ceremony and handed over the reigns of the state to Rishabha Kumar. The ceremony was attended by all members of the family, large number of twins, and gods. The gods created a golden throne and anointed Rishabha with the water collected from various pilgrimage centres. They attired him in divine dress and ornaments and formally put the crown on his head. The twins humbly poured water on his feet from the cups made of lotus leaves. Rishabha became the first king of this era. The king of gods ordered Kuber, the god of wealth, to construct a suitable city. This beautiful city was named Vinita; later on it became popularly known as Ayodhya. For many years Rishabha dev continued to rule his people and open new frontiers of knowledge. During the reign of his father the population was organized into random groups only. Rishabhdev reorganized them according to their virtues, activities and professions, and broadly divided the society into three groups. Trading community was known as Vaishya, martial community was known as Kshtriya and all other people indulging in a variety of services were known as Shudra. Till his times the Brahman group was not formed. After a long span of time (6.3 million Purva) he started losing interest in mundane things and activities, and started drifting towards detachment. Once, while he was watching a dance, the dancer suddenly died. . Rushabhdev became very disturbed by this incident. He started pondering over the incident and realized that every phenomenon and every situation in the universe undergoes changes and that no situation stays forever. He developed complete detachment for everything that is impermanent and ephemeral and he decided to devote his life to the search of lasting happiness. He felt that he should transfer all his responsibilities to his sons and proceed towards liberation through spiritual practices. He also desired to reach the state of omniscience and consequently show the path of disciplined life and spiritual practices. His concept was that indulgence in mundane things does not give happiness. It gives only an illusion of happiness. True happiness is derived out of freedom from mundane indulgences. After one year of meritorious charity, Rishabhdev sat in the palanquin named Sudarshana and arrived in the Siddharth-vana garden. It was the eighth day of the dark half of the month of chaitra when, under an Ashok tree, Rishabhdev abandoned all his apparels and ornaments. He started pulling out his long strands of hair. After four fistfuls, when he was pulling out the fifth fistful of hair Indra said, "Sir! This strand of hair on the crown of your head and hanging down over you shoulders looks attractive. Kindly leave it as it is." Rishabhdev agreed. Due to this bunch of hair he got he popular name-Keshariya ji (one with hair). The king of gods collected the hair pulled out by Rishabha dev in a divine cloth and immersed them in the divine ocean of milk. Following the example of Rishabha dev many of his subordinate rulers as well as common people got inspired to embrace the ascetic way of life. It is mentioned in scriptures that with Rishabhdev four thousand others also took Diksha. After becoming an ascetic, Rishabhdev took the vow of total silence and started wandering accompanied by other ascetics. When, after his penance, he went out to beg for food, he did not get anything to eat. The common people of that age were ignorant about the practice of giving food as alms. They did not even appreciate the need to do so. Whenever Rishabhdev approached them, they offered him respect and valuable gifts as they would to a king. Rishabha dev would then proceed ahead without accepting anything. As time passed the accompanying ascetics conferred among themselves and decided to eat fruits and vegetables naturally available. They slowly drifted away from Rishabha dev and the true ascetic way of life. After one entire year of wandering from place to place and doing harsh spiritual practices without touching any food or water Rishabha dev decided to beg food once again. He came to Hastinapur town. Bahubali’s son, Somprabh, was the king of Hastinapur. His son Shreyans Kumar saw a dream during night that Suvarnagiri, the golden mountain had turned black and he had brought it back its golden color by washing it with pitchers full of milk. He narrated his dream to his father and friends, but no one could interpret its significance. Shreyans Kumar was sitting in the balcony of his palace and brooding over the dream he saw last night. All of a sudden he heard the noise caused by happy masses who had seen Rishabha dev entering the town. Thousands of citizens of Hastinapur rushed toward Rishabhdev with gifts. Rishabhdev did not even look at these things and continued his graceful walk in the direction of the palace. When Shreyans saw approaching Rishabha dev, he rushed to welcome his great grandfather. After bowing down at the great ascetics feet when Shreyans looked at Rishabha dev’s face he could not shift his gaze. He went into a state of meditative thoughts and suddenly he acquired Jati-smarana Gyana, the knowledge that opens up memories of the past births. In his past birth Shreyans was the charioteer of king Vajranabha (the past incarnation of Rishabha dev). This knowledge also made him aware of the duties of laity toward Shramans. He realized that Bhagavan Rishabha dev had been wandering around without food or water due to the prevailing ignorance of the people regarding ascetic norms. With due reverence he requested Rishabha dev, "Prabhu! I am honored by your presence. I have just received 108 pitchers full of fresh sugar-cane juice that are pure and suitable for you in all respects. Kindly accept the juice and break your fast." Rishabha dev extended his cupped palms and Shreyans poured the sugar-cane juice from a pitcher. Rishabha dev broke his fast and the skies reverberated with the sound of divine drums and divine applaud, "Hail the alms giving!" The gods also showered gems, flowers and perfumes. This was the beginning of the tradition of religious charity and alms giving. In memory of this incident, the third day of the bright half of the month of Vaishakh is celebrated as Akshay Tritiya festival. The Jains specifically celebrate it as the breakfast day after the penance of Varsha Tap (one meal and fast on alternate days for one year). For one thousand years Bhagavan Rishabha dev continued his harsh spiritual practices completely ignoring his body and other mundane activities. On the eleventh day of the dark half of the month of Falgun he was meditating under a banyan tree in the Shakatmukh garden outside Purimtal town, close to Ayodhya. Around forenoon he transcended to the purest higher state of meditation. The intensity of his practice caused the shedding of the knowledge and perception obscuring Karmas as well as the illusory Karmas. As a result, he attained omniscience, the purest and enlightened state of soul. Rishabha dev became a Jina. When Rishabha dev attained omniscience the whole world was filled with a soothing glow for a moment. Numerous gods descended from heavens to pay their respects to the Tirthankar. They also created the Samavasharan, the divine pavilion. King Bharat also proceeded toward the divine assembly riding an elephant and taking along his grandmother Marudevi. Apprehensive about the hardships of the ascetic life of her son, Marudevi was relieved when she beheld the scintillating face of Rishabha dev sitting in the divine assembly surrounded by happy and dazzling gods. The vision of her son perched on the spiritual pinnacle triggered the flow of spontaneous joy in the heart of Marudevi. This mundane joy slowly turned into the ultimate bliss and she acquired omniscience. Coincidentally, at the same moment she completed her age and became liberated soul (Siddha). Bhagawan Rishabha dev made the announcement Marudevi had become a Siddha. In his first discourse Rishabha dev detailed the trilogy of right conduct. Knowing about the significance of life as a human being and importance of a dutiful life, thousands of people including Rishabhasen, the eldest son of Emperor Bharat, and five thousand other members of royal family embraced the acetic way of life. Thousand of other persons accepted the Shravak Dharma (the religious way for laity). 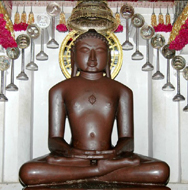 As he founded the four pronged religious ford at the beginning of the present era, Bhagavan Rishabha dev became popularly known as Adinath, the first Tirthankar. The first disciple of Bhagavan Rishabha dev was Rishabhasen. He became the first chief disciple. He was also known as Pundarik. For a long time Bhagavan Rishabha dev continued to propagate his religion having the five great vows as its central theme. When he realized that all his remaining Karmas are approaching their end he proceeded to the Ashtapada mountain. On the thirteenth day of the dark half of the month of Magh, a little before noon time, Rishabha dev, along with ten thousand other ascetics, was observing a six day fast without water. He was sitting in the meditation in the Paryanka pose. When the moon entered the Abhijit lunar mansion he got nirvana and got liberated from all sorrows. The king of gods, Saudharmendra, Emperor Bharat, numerous gods and men gathered and celebrated the auspicious event of Bhagavan Rishabha dev’s Nirvana.